If you are the lucky owner of a Norton motorcycle, then you need to have the right repair workshop manual for your bike. Most of the Nortons built back in the 1970s and prior, were the superbikes of their day, and they are sought by motorcycle collectors worldwide. So it is a good idea to insure your bike is maintained or serviced properly, and that's why adding the right Norton repair manual to your library, is a smart idea. Fix or restore your Norton motorcycle! Vintage Norton motorcycles are the quintessential British motorcycles, and although they can be somewhat temperamental, they are beautiful machines that are a ton of fun to ride. They truly are "road handlers" when tuned right, and using the correct repair manual to get them to that level, is almost mandatory. The Norton repair manuals by Clymer and Haynes available from us, are written for the DIY mechanic who likes to tinker on his or her bikes in the comfort of their own home workshop. Clear step-by-step procedures are outlined, and accompanied with sharp pictures or diagrams that show you what the part being worked on looks like, and how its components fit together. And even though all you may need to do at this time is to give your bike an oil change, replace the spark plug/s, or something basic like that, these manuals can help the average person with basic mechanical ability, perform from service and maintenance jobs, all the way to a complete ground-up restoration. 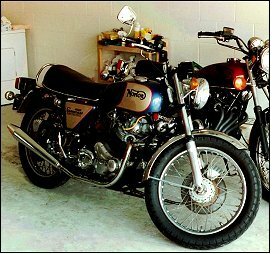 Over 20 years ago, I used the Norton repair manual by Clymer — which has now been combined with other two manuals into the Vintage British Street Bikes Repair Manual: BSA, Norton & Triumph — to restore a 1975 Norton 850 Commando, purchased for $50, to show-winning quality. Granted, I took some liberties as far as replacing the points ignition with a Boyer electronic unit, and — purists forgive me — I replaced the rattling Amal carbs with a single Mikuni carburetor kit. Other "improvements" included Japanese bike coils, using ATF in the primary case (instead of heavy oil), and Yamabond to keep oil seepage under control. That manual gave me a good understanding of my Norton and allowed a regular wannabe mechanic (who didn't even have a garage), to bring a classic Norton Commando back to life. 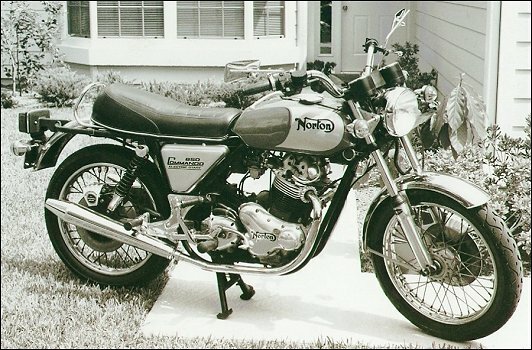 Above: Luis restored this 1975 Norton 850 Commando back in the late 1980s. The bike was literally "buried" up to the axles in a back yard in South Florida from where it was rescued. Luis paid $50 for the bike and the original title. Then restored the motorcycle back to its former glory — with the exception of paint colors and a few other improvements. 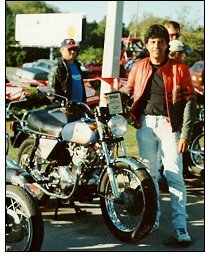 Luis sold the Norton sometime in the early 90s and invested the money to start the company that would later launch this very website.